The number if licensed bunker suppliers in Singapore has fallen to 50, according to the latest information from the Maritime and Port Authority of Singapore (MPA). The Barrel Oil Pte Ltd is the supplier that no longer features on the MPA's list effective April 5, 2019. In terms of sales volumes, since 2010 Barrel Oil has moved from being a mid-table ranked supplier to placed last on the list for 2018. There has been no official comment from MPA or Barrel Oil on the exit, which suggests the licence was simply not renewed, and Ship & Bunker has so far been unable to reach the company for comment. Information on the The Barrel Oil website says the company was established in 1990. 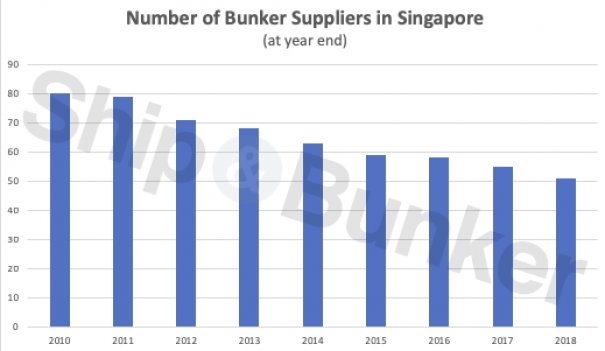 The number of licensed bunker suppliers in Singapore has been steadily falling, having stood at 80 in 2010. Guidelines developed by PPR 6 in February will be sent for approval by the Marine Environment Protection Committee in May (MEPC 74).